Seagull's latest Bi-Conic offering is built on years of successful standard Bi-Conic production and use. It achieves new levels of performance needed by today's ever increasing requirement for higher production demand. Critical internal surfaces have been optimized to provide zero air gap change due to temperature excursions so air bearing performance remains constant under speed and power loading. Lighter inertia allows extremely rapid acceleration/deceleration without the need for higher output motor drivers. Externally identical to our existing Bi-Conic spnidle system the new Biconic Mark 2 spindle is in a performance class of it's own. One major advance is it's ability to support lighter and shorter disk clamping. This effectively reduces both rotary inertia and load capacity. By placing the plane of the disk closer to the working air bearing surfaces, disk error motions are reduced for better process efficiency. Optimized for use with both 95mm and 65mm hard disks of all thicknesses and materials, the Biconic Mark 2 spindle can be outfitted for many other industrial applications. Often, "necessity is the mother of invention" and this was certainly what drove the development of the new Biconic Mark 2 Spindle. A competitor's spindle had been specified for a new equipment build where high throughput was a critical parameter. Mated to a Trust 620 Linear Motor Controller and asked to operate past it's safe operating specifications, the "D" spindle was simply too heavy to make the development effort economically viable. Seagull's "low inertia" spindle was a significant improvement but it was decided to explore what was possible by developing a fast track new bearing. 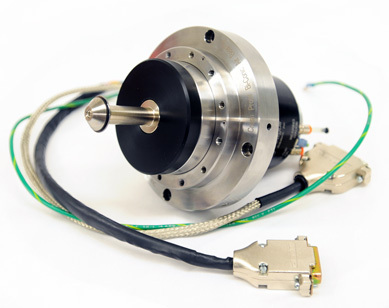 Knowing that the objective would be to set the performance envelope at a level consistent with the maximum duty cycle current of the controller, and knowing that much of that energy would be directed at the spindle motor, thermal management was critical. A significant advantage of the Bi-Conic configuration is that the rotor can thermally expand axially and radially without affecting the air gap if material properties and conic angles are coordinated. Based on air flow as well as physical clearance testing the resultant bearing changed working clearances by less than 1% over an 80° temperature range. While the finished spindle never exceeded 90° F at maximum duty cycle, the Biconic Mark 2 could have tolerated 140°+ without any performance degradation. Due to total spindle system inertia reduction being, critical it was decided to form a smaller clamp mounting flange that could be recessed into the spindle rotor. This had the dual advantage of also reducing load cantilever (Z Height). With acceleration/deceleration performance above 40,000 rpm/sec was now possible, a new clamp design was necessary to provide high, non-particulating, non-distorting disk clamping in the automation setting. Standard on all Seagull spindles is the integral particulate evacuation feature that will not only evacuate the spindle exhaust air but also evacuate the clamp mechanism, even when used with a pressure actuated clamp. The result is a new class of Air Bearing System performance that will shave precious seconds off disk processing times thereby increasing production output without adding equipment or personnel.